OK so he keeps telling me about the French Quarter and certain escapades he has had (he’s supposed to pack knee-pad). So haven’t heard from him in a few days, understandable, since Isaac rolled into town last week. What I am more worried about is that its Southern Decadence this week. (Shaking head) What kinda trouble can that boy get himself into? So the search for Tasty brought me to New Orleans City, I landed on Bourbon Street. There are definite signs of a party having been here, the street sweepers haven’t been through yet. 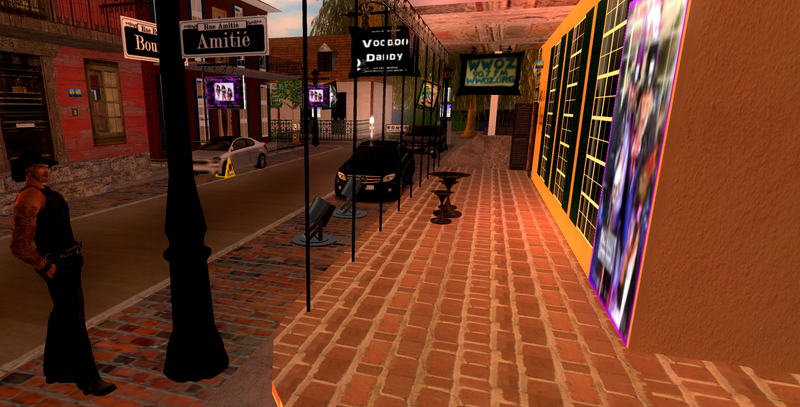 I next made my way around to the corner of Bourbon and Amitie. I think I am getting closer can’t be sure though, this place is bigger than I realized. But that car in the background looks familiar – see it the booted one. I think that might be his. Moving on I made my way into Quinsters Blue Joint. Pretty quiet looks like it could be a hoping place. Will have to come back again another day. If I ever find that dang Tasty. Wandering down Canal Street I must of taken a wrong turn, its getting a little dark at this point. I came upon this sign warning that the swamp is dangerous. And damn if I didn’t’ see a LARGE snake. Babe Tasty, hun, Love ya but if your out there, your on your own. OK its getting late, one more place to look, down by the water I heard there is a club on the beach. Made my way along the winding streets and found “the real Rock Club” nice place, but dang saw one LARGE gator on the beach. Daddy Bear over and out. Daddy Bear got a bit of a chance to go exploring this morning. This location is such a treat it will require multiple visits. As I have said in the past, I am a fan of great retro in SL. Well my friends this is the retro place to explore. The Arkansas State University Heritage Project has recreated the Dyess Colony from Mississippi County Arkansas as it looked in 1934. The colony was founded in 1934 as part of President Franklin Roosevelt’s New Deal program. Please follow those links for more information. 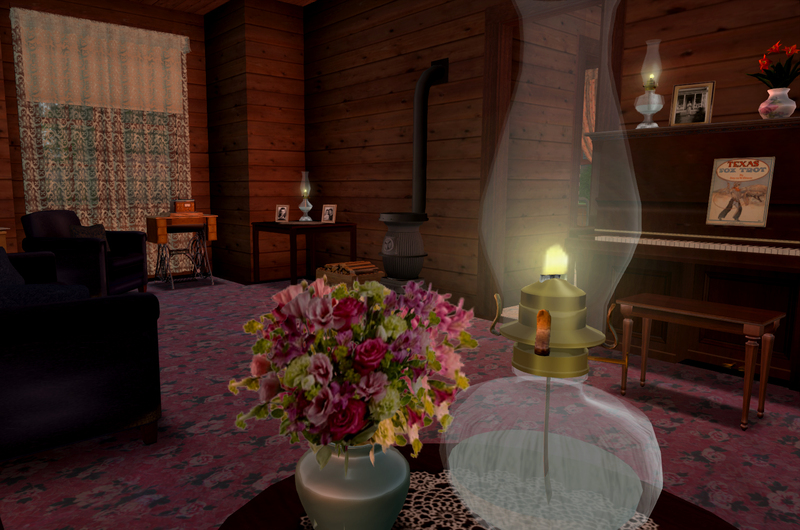 What brought me to this build was this post i came across on Second Life Newser about Johnny Cash’s boyhood home. I grew up on Johnny Cash and June Carter Cash. Didn’t have a great appreciation for them at the time. But came to realize, despite his vices, Johnny Cash was one of the brilliant musical story tellers of our times. 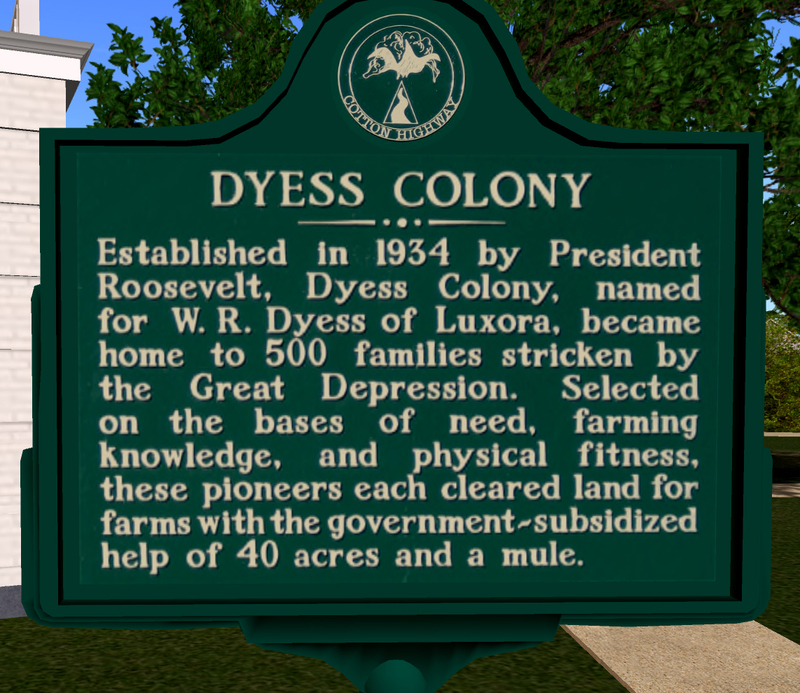 On the ASU Dyess Colony sim, you can find a brilliant recreation of the boyhood home of Johnny Cash here. Please take time to explore the whole sim and the neighboring sim. The architecture and the detailing are truly amazing. Ok Daddy Bear is passing along some very important information. Major theft and LL won’t help. Fraud Alert: This Could Happen to YOU! On 8/31 Lili155 posed as a shop renter & hacked into a rent box, turned it into an ATM & stole Thousands of L$ from Insyx Piranha, wiping him clean. When LL realized during the service call that he is not a Premium Acct, they stopped helping him & said their hands were tied. This is a security issue that can potentially affect anyone who rezzes an object marked for sale: a vendor sales board, a tip jar.